The beautiful girl in the picture is Molly. Molly presented to Vet extra after a decline in her ability to walk which would improve but then decline again to the point she required assistance walking. On examination Jacques found that Molly was unable to walk on her hind limbs (paraparesis), with the signs she exhibited being consistent with injury to the spinal cord in the area L2 – L4 (Lumbar). MRI scanning confirmed the presence of an intervertebral disc extrusion in this area, with disc material extending over 3 vertebrae in length (top MRI picture) with left sided spinal cord compression. 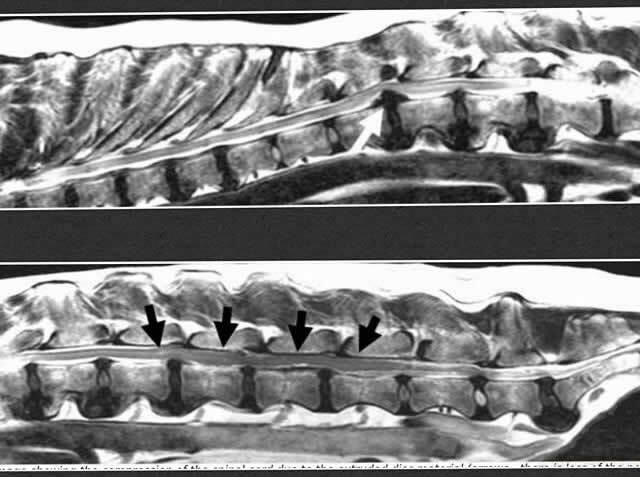 As well as this finding an additional disc extrusion was identified in the thoracic region of Molly’s spine (bottom MRI picture), this was a very severe disc and was causing marked spinal cord compression. 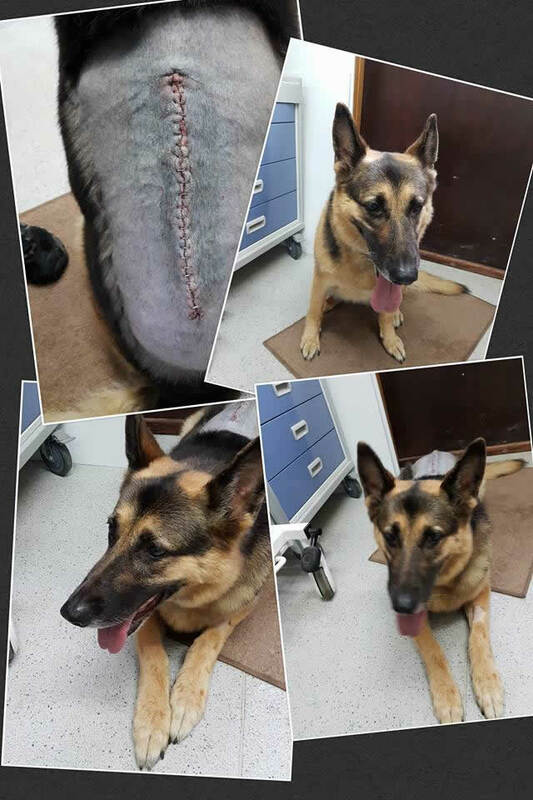 Molly was taken to surgery and had the extensive extrusion addressed by a continuous Hemilaminectomy, and the affected discs were fenestrated to limit the chance of recurrence at these sites. The thoracic extrusion was addressed by performing a Corpectomy to decompress the spinal cord. Molly remained hospitalised in order to monitor her progress and ability to urinate and defaecate. She remained on strong pain killers in the first few days to keep her comfortable. She went home after a few days into her lovely owner’s care where she would be strictly rested for a number of weeks before starting to get back to normal. Molly was such a fantastic patient and very tolerant of all the procedures we carried out. She was a character in the ward and we wish her a good and steady recovery and we look forward to updates.